Elevation by Stephen King is such a short novella that I packed a just-in-case book for my commute to work that day. Lucky, because I finished Elevation about half-way home (my all-up reading time was about an hour). The story starts with Scott Carey, a divorced, middle-aged all-round good bloke visiting a friend who is a retired doctor. Scott is worried because he is losing weight on the scales, several pounds each day, without losing any bulk. Mysteriously, Scott weighs the same amount regardless of whether he is naked and empty-handed, or fully dressed and laden with coins, dumb-bells or other heavier items. Scott is reluctant to formally visit a doctor for fear of being roped into a series of tests which will use up what is left of his life, as Scott believes he will either die or float away once his weight becomes lighter than air. As his weight loss continues though, Scott feels wonderful physically because he is the size of a tank and has retained the muscles to support his old weight. At the same time, Scott is also having problems with his new neighbours and their dogs. The two women recently moved to Castle Rock (the fictional setting of loads of Stephen King’s stories) and opened a restaurant. The locals won’t support the restaurant because the women are married lesbians and understandably the women are becoming fearful, sad and embittered. Scott tries to be a good neighbour but Deirdre, a former top athlete, has too big a chip on her shoulder to recognise a friendly gesture when she sees one. Castle Rock’s annual fund-raiser, a 12 kilometre fun run (huh?) is coming up, and Deirdre is expected to win it. Scott bets Deirdre that he will win the race and if he does, she and her wife have to come to dinner with him and be friendly. She reluctantly takes the bet, although she wants nothing to do with him. Although the story is lightweight (get it? lightweight?) and the characters are stereotypical, I enjoyed this story up until nearly the end, when it seemed to me that the author didn’t know how to finish and just decided, ‘oh, this will do.’ I did enjoy the in-joke of Pennywise from Stephen King’s It making an appearance in the story though. Sleeping Beauties was co-written by Stephen King and his son, Owen King. Most women fall asleep eventually, despite their attempts to resist. A handful of women stay awake right through the story because they are insomniacs, or because they have access to drugs. Sleeping Beauties was too long, had too many boring bits and went down too many rabbit holes. I struggled to stay interested, even though the sleeping women went to another world with no men, no wars and with none of the drama that men have historically created. The real world, with men now running the show, wasn’t anywhere I would want to live, as with no women left, no one ironed, cooked or cleaned, while other men took the opportunity to burn sleeping women to death. A supernatural element in the story didn’t improve things. I was disappointed such a long book by Stephen King could have told so much more of a story. I skipped the last 200 pages to read the last few pages and wasn’t at all surprised by how things worked out. Yawn. I just wasn’t feeling it with Stephen King’s End of Watch, the last story in the trilogy which started with Mr Mercedes. Mr Mercedes was an excellent read, with great characters and a story that kept me turning the pages when I should have been doing other things, such as sleeping, doing housework or going to work. The second book in the set was Finders Keepers, which could have been read as a stand alone novel. Despite being unnecessary to the trilogy, I enjoyed Finders Keepers too. End of Watch went on another adventure as well as adding onto and tidying up all of the loose ends from Mr Mercedes, but the story just didn’t grab me. I was finding it hard to work out why, because I always enjoy the feeling of familiarity of being in Stephen King’s world for a few days and I’ve become quite fond of the characters in this trilogy. Then I realised that the previous two stories were straight crime novels, but End of Watch had some supernatural elements which one of the characters developed as the story went on. This seems to me to be a cheat. A crime novel should be a crime novel. Same for a supernatural novel. If you’re reading this, Stephen King, don’t add a different element at the end of a three-book story and expect me to like it. This is comparable to reading about a fantastic adventure which ends with the line, “and then I woke up,” which everyone knows is not playing fair. However, despite my disappointment with the twist in End of Watch, Stephen King is still one of my favourite authors and I’ll be lining up for his next creation, along with his other Constant Readers. Finders Keepers by Stephen King is more of the same. More getting so caught up in the story that I read until way past my bedtime. More being tired and cross all the next day at work. More racing through my jobs when I get home so that I can get back to reading the story. More anxiety over a bunch of characters who I come to care about after just a few pages. I know I say this every time I read a Stephen King novel, but I don’t know how he manages this. Finders Keepers should be read after Mr Mercedes, as many of the characters have already appeared in, or are in some way connected with characters who first appeared in Mr Mercedes. The stories are quite separate though and would stand alone if you really can’t wait to read them in order. Finders Keepers starts with a young man, Morris Bellamy, breaking into the home of a reclusive author. This author wrote a trilogy of books which became American classics, and while the Morris’s friends intend to steal cash from the author, Morris is looking for the author’s manuscripts, in particular, unpublished works, in order to feed his obsession about the main character in the books. The author and Morris have a literary argument about the plot, which Morris thinks was a cop-out, and in a fit of rage he kills the author. Morris finds the manuscripts he was hoping for and cash, then kills his accomplices too. He hides the manuscripts and cash in a safe place, then is caught for an unrelated crime and goes to jail for 35 years before he can read the unpublished stories. Years later, a boy finds the manuscripts and cash. He uses the cash to help his family, who have been down on their luck since being caught up in a horrific incident which was at the centre of the plot for Mr Mercedes, and goes on to read the unpublished manuscripts. Things get scary when Morris gets out of jail and comes looking for the manuscripts after having waited 35 years to find out what happens next. I love that Stephen King gets how much writers and readers love stories. The Bazaar of Bad Dreams by Stephen King is a book of short stories. None of the stories are truly scary, in the way Stephen King can leave you too frightened to get up in the night to go to the toilet at night without putting the light on, in the way of It, Cujo or Christine (at least they were for me), but the stories are still good enough to leave you thinking about the plot or twist or even some of the characters after you finish reading. I prefer Stephen King’s longer short stories or books, and think some of these stories could have been stretched out a bit more. The following stories were my favourites. Morality is a story of temptation. If a dying man who offered you a fortune to carry out an act of violence on his behalf, would you do it? How much money would be enough, if you were to do it? I’m not comfortable thinking too deeply about these questions, because that implies that I might do something terrible for money. The Dune is the story of an elderly judge, who visits a magical place where he is sees the names of people about to die. I can understand why visiting this place to see the names could become addictive. I particularly loved Batman and Robin have an Altercation, which is a story about the relationship between a man and his elderly father, who has dementia. The affection these characters have for each other comes through despite their difficulties. Summer Thunder is the last story in the collection, and is an end of the world story reminiscent of On the Beach by Neville Shute. I hate thinking the end of the world could come in this way during our time, but it is possible, and that makes Summer Thunder the story that will stick in my head. I can recommend The Bazaar of Bad Dreams to Stephen King fans and to readers who don’t enjoy horror, or the supernatural. 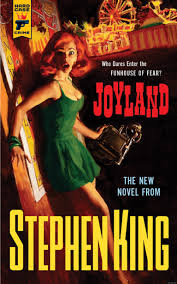 For me, a visit to any place created by Stephen King is a visit to Joyland. So, how good a title is Joyland then? Joyland is set in the late 1960s or early 70s and is told by Devin Jones, as an older man looking back at the summer he had his heart broken by his college sweetheart Wendy. (In my opinion, she was no good anyway. Devin is a sweetie, and did much better eventually than the horrible Wendy). Working his way through college, just as people used to do, (sorry, couldn’t resist! ), Devin had a summer job at Joyland, which as the name suggests, was a fun park, with hot dogs, ferris wheels, roller coasters, fortune telling and Howie the Happy Hound, Joyland’s doggie mascot. Working at Joyland, Devin learned carny language, (like ‘carny’), made friends for life with his fellow college-student co-workers and saved a few lives. Intriguingly, Devin also learned about the murder of a young woman, whose throat was cut inside the Horror House, several years before Devin’s summer at Joyland. While this book is a crime story, it wouldn’t be a Stephen King story without a few touches of the supernatural. Several characters have the gift of ‘the sight’ and a surprising amount of characters were able to see the ghost of the woman who was murdered in the Horror House. (What I want to know is, how come nobody ever writes ghost stories set in hospitals? Surely there must be more ghosts hanging around hospitals than anywhere else. Nurses, doctors, cleaners, kitchen staff, visitors, not to even mention patients; they should all be terrified. But for some reason, nobody ever talks about seeing ghosts in hospital). Anyway, despite his broken heart, Devin became interested in the mystery of the murdered woman and started investigating her death. He very cleverly figured it all out, before the book raced to an exciting conclusion. As the narrator, Devin is quite a nostalgic type. His insights, which came at the end of each chapter or section, eventually became irritating. For example, after reflecting on the end of his relationship with that no-good Wendy, he tells the reader, “When it comes to the past, everyone writes fiction,” and “Love leaves scars,” and “You have to remember, I was only twenty-one.” Etc. nd so on. And again. His insights were smart enough, but I got sick of them. Just like most heart-broken teenagers, Devin became boring and self-absorbed, although I’m sure he grew out of it. (All right, all right. I can remember crying over someone whose name I can’t remember. I was fourteen. He was ‘The One.’ Or the one after was, I forget now). However, as a crime story, I actually forgot about trying to solve the mystery of the woman’s murder as I was more interested in the stories about the amusement park. (An evening visit to the beach carnival was the highlight of my summer growing up, a few hours of giggling with my friends, being slammed around on the Thunder-Bolt and riding the Dodgem Cars, checking out the cute boys who ran the rides and stuffing ourselves with fairy floss. Pure joy. That’s probably where I fell in love with ‘The One.’ I know I went on the Cha-Cha with him). As a mystery, I figured out who-did-it without too much trouble. Stephen King gives you a few clues, but he also leads you astray here and there, and of course throws in enough of the paranormal to make the reader uneasy. Just don’t go in the Horror House. I feel as if I am about to betray one of my favourite authors in this post. Here goes. I didn’t love Revival by Stephen King. The main character in Revival is Jamie, who was a child at the beginning of the story. Jamie is one of a large, mostly happy family living in a small community. He and his family are members of a church ministered to by the Reverend Charles Jacobs. The minister is a charismatic man whose passion is electricity. When his wife and son were killed in a tragic accident, Reverend Jacobs lost his faith and in his misery, preached what became known as the ‘Terrible Sermon’, using horrific examples of unlucky coincidences to ask why God allowed the deaths of innocent people. Listening to the Terrible Sermon, Jamie lost his faith too. As always, Stephen King created a fast connection between me and his characters. I felt as if I knew Jamie, Charles Jacobs and the other key characters, their passions and their strengths and weaknesses. I don’t know how he does it, but I like it. Not surprisingly, Charles Jacobs left town after the Terrible Sermon. The next chapters were a happy contrast to the previous part of the story, filled with Jamie’s nostalgic memories of growing up, his teenage sweetheart and his joy at discovering music. Charles’s electricity turned out to be more than the usual stuff you get when you flick a switch though, and the buyers of the photos were unwitting guinea pigs for Charles’ research into ‘secret electricity’. Charles uses his secret electricity for healing purposes as well as for tricks and using it, he cures Jamie of his heroin addiction. As the story continues Charles gains a large following as a healer and he rakes in cash, which he uses to further his research. The secret electricity idea is intriguing, but it wasn’t apparent to me until almost the big moment at the very end where Stephen King was going with this plot, which became terribly dark and bleak. Over the years, Stephen King has stolen a lot of sleep from me. I’ve hashed over the wickedness of Apt Pupil for years. Nearly thirty years after reading It, I’m still frightened when I use the toilet at night in case that bloody clown who lives in the drains gets me. Pennywise. I can’t even say the name without feeling uneasy. Thinking about The Sun Dog sends shivers down my back and as for Misery, there were quite a few pages which I could only read by peeking through my fingers at the pages. The promise of Revival felt unfulfilled though. The story built up and up and up, but the big moment, when it finally arrived, wasn’t big enough to satisfy me. I wanted more gory details, more horror, more scary imaginings to keep me awake at night, but I didn’t get it. Unfortunately, (?) tonight I will sleep just fine. Revival had the potential to scare me every time I flicked on a light switch for the next twenty years, but Stephen King didn’t take his opportunity with this story.